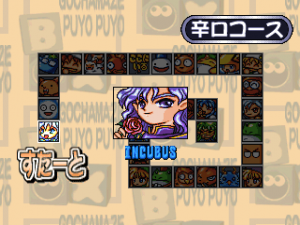 Compile’s last entry in the series ends it off with quite a bang, as Puyo Puyo Box is easily a game with no shortage of content. Not only are past games included in this game, but there are a variety of multiplayer additions to make playing with friends that much more enjoyable. To top it all off, the game’s largest feature is a single player RPG-styled mode – something entirely new to the series, and surprisingly done quite well. 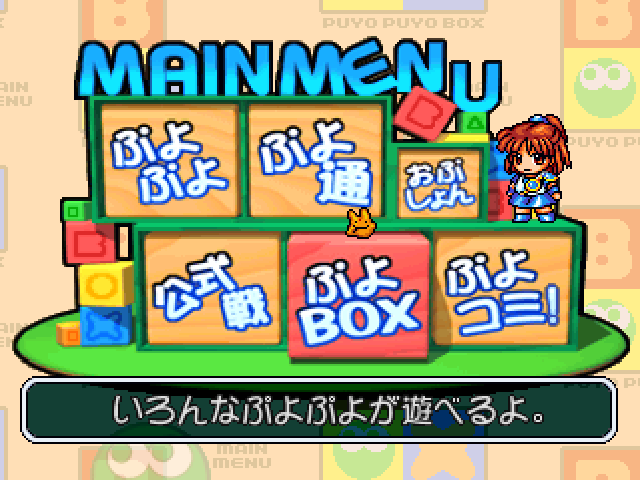 No matter what you’re looking for, Puyo Puyo Box is a game that ensures that you won’t be bored with what it offers. 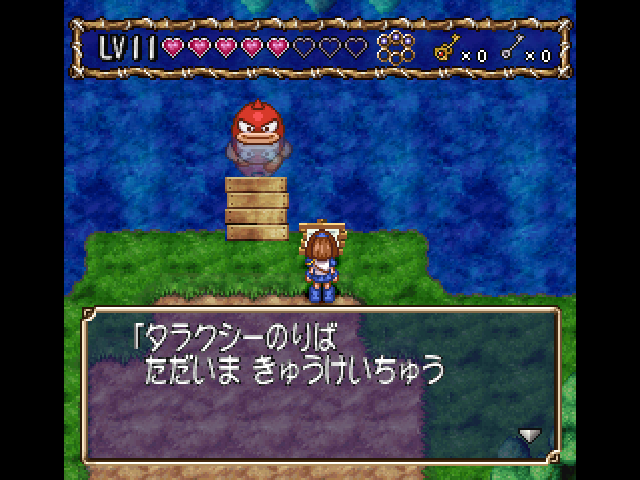 The game’s main draw is its RPG-styled Quest mode. 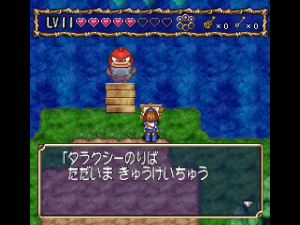 Previously, Rulue no Tetsuwan Hanjouki was the closest the series got to a traditional RPG, as it had things such as an overworld, various hub worlds, and characters to talk to. 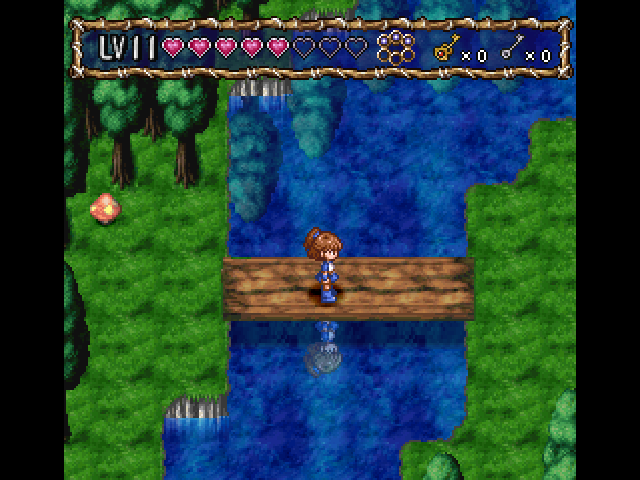 Puyo Puyo Box builds upon this by offering a few more things: equipment, random encounters and even dungeons to explore. All of these features coupled with the ones from Rulue no Tetsuwan Hanjouki make for a very fulfilling and overall engaging experience, each deserving of their own glance. Perhaps the most interesting feature is how the equipment works in this game. Although the fact that equipment alters your stats (attack, defense, and speed) is nothing new to an RPG, what is new is how it affects you in battle. In an odd twist, the mechanics that have become standard in the series are now tied to what equipment you use: things rotating your puyo, seeing your next (two) pieces, rotating puyo in between a column and offsetting are all “bonuses” that equipment can have. This is actually a rather interesting concept, as it forces you to think beyond simple stat bonuses; instead, you’re often forced to think in terms of which mechanics are best suited to your style of play. However, this isn’t to say that stats don’t matter, as the game has been balanced in such a way that enemies can pose a threat if you don’t pay attention to your stats. 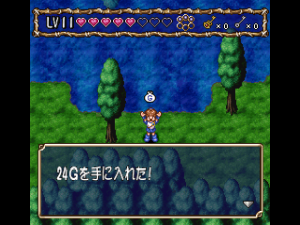 As for your stats themselves, they’re pretty basic: there’s attack, which augments the strength of your chains, defense, which augments the strength of the opponent’s chains, and speed, which not only affects how often you’re able to escape from battle (trying and failing taxes you with three lines of nuisance puyo), but how fast your puyo fall. 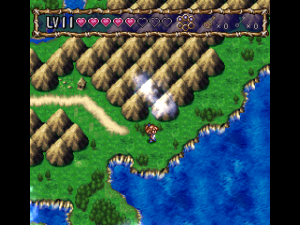 As for the battle system itself, it isn’t too much of a deviation from the standard format. 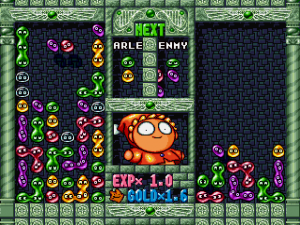 As stated before, there are random battles while you wander around the overworld or a dungeon, each solved with through a puyo battle. The incentive to playing through these encounters is winning gold and experience. Interestingly enough, there are multipliers on the earned gold and experience; experience has a multiplier that increases with the chains you do (the larger the chain, the higher the multiplier), and gold has a multiplier that decreases the longer the battle takes. 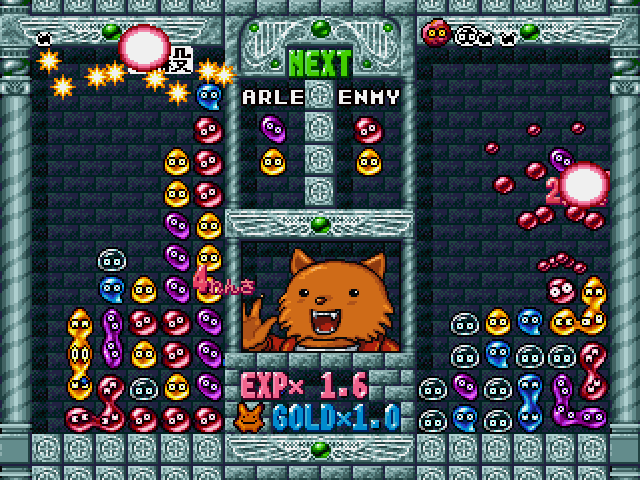 This creates a reward system that not only helps out skilled players, but also gives you further incentive to better your puyo skills so that you can claim greater rewards from battle – something not seen in many RPGs. If you lose a battle, you lose a heart: if you lose all of those, the game is over. Although you start with three, you gain items after every boss fight that increases your stock of hearts by one, up to a total of eight. 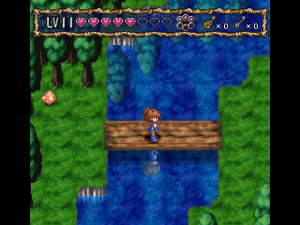 Overall, the RPG-styled experience is quite a blast to play through, and the only criticism that can be held against it is that the mode is a bit short – it’s easy to complete in a handful of hours, most likely due to the fact that it isn’t the only experience Puyo Puyo Box offers. 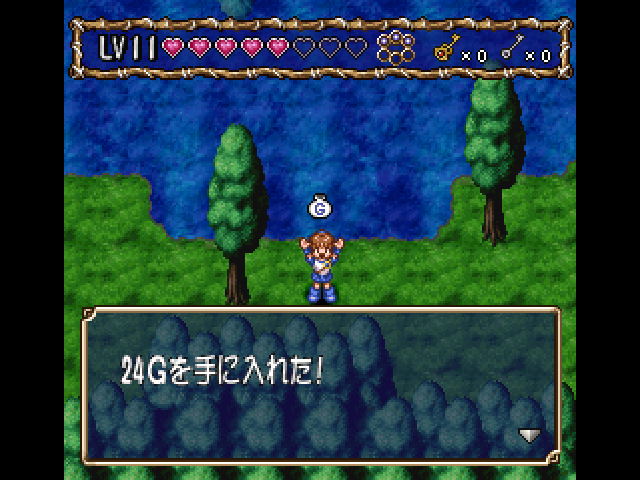 Still, the RPG mode is easily the most interesting part of the whole game, due to how it handles battles, as well as how polished the overall experience feels, making you look at the mechanics of Puyo in a different light. 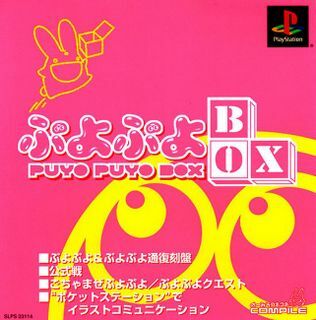 Of course, the RPG mode isn’t the only thing Puyo Puyo Box has to offer. 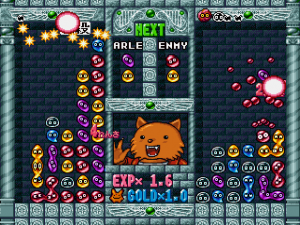 Along with very bare ports of both Puyo Puyo and Puyo Puyo Tsu, there are various, yet small singleplayer and multiplayer modes to enjoy. 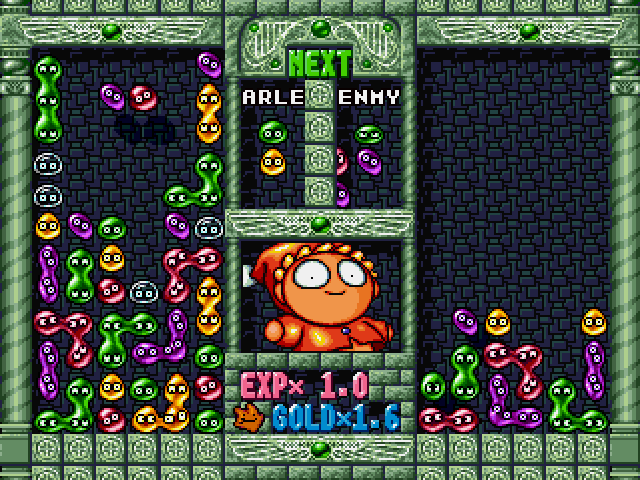 In the singleplayer mode, you’re given the option of facing 10, 20, or 30 computer opponents in a row – much like the expert mode offered in ports of Puyo Puyo Tsu. What’s interesting about this mode is that you’re able to battle opponents using mechanics from the first four Puyo Puyo games, a feature that makes the experience much fresher and adds a bit of replayability to it as well. Your opponents can use these mechanics as well, adding in a good deal of challenge. 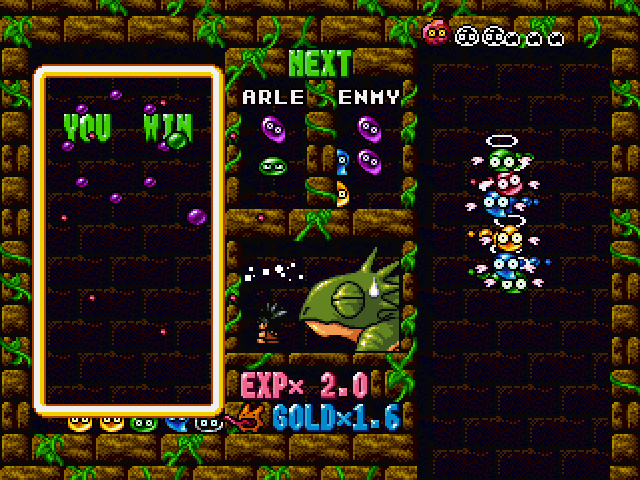 The skills from Puyo Puyo~n have even been retooled, fixing much of the tedium that came with the game. All in all, the fact that you can pick your own mechanics makes for quite an interesting experience, as it makes the mode feel like every route you go is unique. As for the multiplayer modes, they’re split in between two and four player sections, but they’re both fundamentally similar. 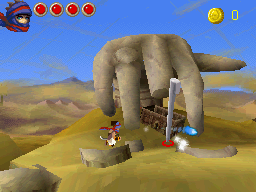 The standard battle mode is kept in this game, but with a twist: each player is able to choose from the mechanics of the first four games to use, just like the singleplayer mode. Not only that, but in four player mode, you’re able to set your own teams between players. As you would expect, it makes for a highly intense battle, as well as a very unique experience overall. Finally, a new mode to play is introduced in this game, both for two and four player modes. In it, a treasure chest is placed at the bottom of the screen, and buried underneath puyo you need to clear. Clearing puyo around the treasure chest grants you victory. 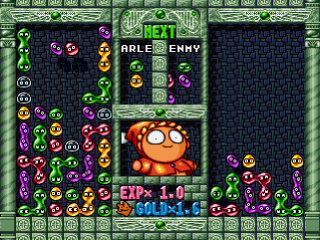 It’s a unique take on the Puyo Puyo formula – one that was later brought back in Puyo Puyo 15th Anniversary. 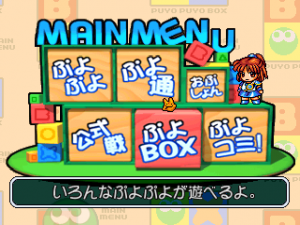 Overall, Puyo Puyo Box is an experience worth looking into. Although the ports of Puyo Puyo and Puyo Puyo Tsu are nothing of note unless it’s for convenience’s sake, the RPG-styled mode, the endurance-type singleplayer mode, and the new multiplayer options all make for a great time no matter how many people play.